"...USB 3.0 promises a theoretical maximum rate of 5 Gbps, meaning it's 10 times faster than USB 2.0. USB 3.0 is also full duplex, meaning it can upload and download simultaneously (it's bi-directional); USB 2.0 is only half duplex. "Put side by side with eSATA and FireWire 800, USB 3.0 is far superior. eSATA, an external connection that runs at the same speed as the internal SATA 1.0 bus, has a maximum theoretical of 3 Gbps. This makes USB 3.0 faster than eSATA and about six times faster than FireWire 800 (full duplex at 800 Mbps)...."
"And they may get one, yet. Apple has on many occasions uncrated new products on the heels of Macworld...."
"You take calls on an iPhone, watch your Apple TV, never leave home without your MacBook Air, and still grin with satisfaction when you fire up your Mac Pro with dual 30-inch Apple displays. But how well do you really know the house that Jobs and Woz built? Answer these 20 questions and find out how you stack up on all things Mac...."
"Macs are built to last but even Apple kit can and does die. "If it's beyond repair, that means you need to dispose of it. You wouldn't dump an old computer in landfill, but many people do. "Every year, mountains of electronic waste are shipped to Asia where they're broken down to their component parts in shocking conditions, with heavy metals and hazardous chemicals leaking into the Earth. "So how green is Apple and is there anything we can do to make it greener still?" Link: How Green Is Apple? "Ian Betteridge is a brave man. Not only is he a Mac user who has switched to Ubuntu running on Dell hardware, he's also decided to say so in public. "Some of you may recognize his name: for some years, he was a writer for, and then editor of, the UK version of MacUser magazine. "Why did he do it? Partly because of price, partly because he cares about open software running on open platforms...."
"You might have gathered from some of my more recent posts that I've switched platform. My main machine is now a Dell laptop, running Ubuntu 8.10. "I've been using Macs since 1986, and have owned one more or less continuously since 1989. Machines that have been through the mill of my day-to-day keyboard bashing include the Mac Plus, LC 475, PowerBook Duo, iBook and MacBook Pro. I've earned a living writing about Macs and attended more Macworld Expos than I can count. "But unless Apple has a change of direction and creates some very different machines, I think that I've probably bought my last one." "In response to my post about switching to Ubuntu Linux, Charles Arthur tweeted a question asking about my computing needs. It's a good question, because - obviously - how you use your computer will often determine your platform of choice." "It is surprising that it took all the way to #40 to call out Apple products. Initially, we were planning for an entire week on Apple products, but that would just be over kill. "Plain and simple, white people don't just like Apple, they love and need Apple to operate.... white people NEED to meet people who use Windows to justify themselves spending an extra $500 for a pretty looking machine.... and remember you need a Mac to creatively check email, creatively check websites, and creatively watch DVDs on planes.... White people also need iPods, iPhones, Apple TV, AirPort Express stations, and anything else that Apple will produce." "With the release of Mac OS X 10.6 Snow Leopard, Apple may be planning to rid its flagship operating system of the various user interface inconsistencies that have materialized in recent years, according to a pair of reports...."
"Apple is ditching Macworld to instead exhibit at CES next year instead, according to one source. "The source, citing 'friends who work at Apple,' insisted the company is ditching Macworld because it will 'go large' at CES, which typically runs concurrently with Macworld in early January. "The International Consumer Electronics Show, or CES, is the big annual gathering of the consumer electronics industry. Held in Las Vegas over several days, it attracts more than 2,700 companies from all over the world, including technology giants like Microsoft, Sony and Nintendo...."
Link: Apple Ditching Macworld in Favor of CES? "One of the more persistent rumors on the Expo show floor this past week - besides the one saying that Jobs would parachute onto the stage during the keynote in order to prove that he's fit as a fiddle - was that Apple would be ditching Macworld next year for the Consumer Electronics Show in Las Vegas, which also took place last week. "Adding fuel to that fire comes news from the Consumer Electronics Association, the organization behind CES, that they're planning an area of the 2010 show focused around 'Apple-related CE [consumer electronics] manufacturers.'" Link: CES 2010 Will Have an Apple-related Area, but What About Apple? "That was the question that the long-running tech trade show's organizers sought to answer this week, which marked the last time the event could count Apple as a participant and its chief exhibitor. "Representatives from show producer IDG Word Expo were joined by several hundred of the Macfaithful, who crowded into a hall here at the Moscone Center this week to discuss and debate the future of the event. "And IDG stressed that the Macworld expo does have a future - at least as far as next year...."
"A report that Apple is planning a visit to CES next year had eyes rolling Friday morning from Las Vegas to Cupertino. "Cult of Mac reports, citing a source with 'friends at Apple,' says that Apple is planning to 'go large' at CES 2010, now that Macworld is out of the way. The source called it a 'done deal,' noting that since Apple is really more of a consumer electronics company these days, the Consumer Electronics Show makes more sense. "Too bad nothing else in this report makes sense...."
"The Consumer Electronics Association has confirmed plans to host a Mac-centric area at CES 2010, but Apple has still not commented on whether it plans to participate. "Jason Oxman of the CEA confirmed Saturday that the group 'dedicated a special area at the 2010 CES to Apple-related CE manufacturers.' That immediately sets up an alternative for companies thinking about exhibiting at Macworld 2010, which will not have Apple present for the first time in 12 years...."
"...I am actually surprised Apple didn't make this move sooner...."
PR: Synectics Business Solutions, Inc. today announced a new version of their software to complement their well-established online backup service. Built upon the same modern infrastructure as their Enterprise version, BackJack's Business version delivers more cost-effective, simpler and more secure online backup for business Mac users. BackJack remains the most trusted name for the online protection and recovery of critical files. Synectics Business Solutions, Inc., developer of the BackJack( Online Backup Service, has announced a new version of their software to complement their well-established service. For those whose use of the Mac generates income, or supports key business activities, BackJack remains the most trusted name for the online protection and recovery of critical files. Their new Business version confirms Synectics' commitment to the storage needs of Mac business and enterprise users where the highest standards for backup and recovery must be set and met. Synectics' upcoming solution, known as Continuum, will complement Leopard's Time Machine® so that both onsite and offsite backups can be performed conveniently and cost effectively. Currently in development, BackJack's Continuum version will complement Leopard's Time Machine® so that both the onsite and offsite components of an effective backup strategy can be met conveniently and cost effectively. PR: Could this be a worthy successor to Eudora? 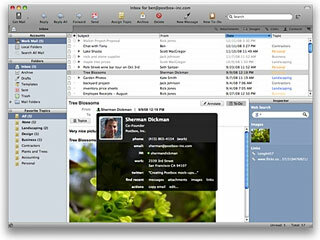 "Postbox is a new way to manage online communication. 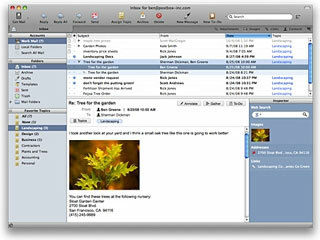 It lets you spend less time managing messages and more time getting things done. But what makes Postbox really useful is the way it lets you find and reuse all kinds of content hidden deep within your email. After all, it's your email. Make the most of it. Postbox lets you organize your mail by topic so you can focus on one thing at a time. Incoming topic-related messages are automatically displayed. Anything else stays in the background until you need it. Don't worry, an unobtrusive counter displays incoming messages by topic so you can still keep an eye on things without losing your focus. Postbox works behind the scenes to catalog everything in your email. We mean everything: every bit of text in the body of your messages, every contact, address or web link. Every picture, document or attachment. It's all in the catalog and it's all searchable. To make what you've found easier to use, search results are delivered in context. Text is displayed in multi-sentence abstracts, messages in threads, and images and documents as thumbnails with associated information. Once you've found it, you can really start doing things. Postbox is designed to break down barriers. 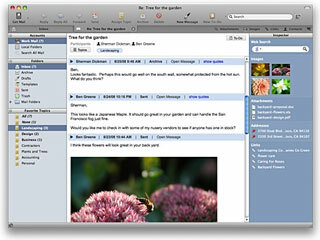 Any mail content can be annotated or combined with information from the web to create new mail messages. Want to get the information out of Postbox? No problem. You can post content to online communities and sharing sites right from the Postbox window. Want to get web content into Postbox? Just as easy. A handy sidebar lets you pull in information directly from Internet search engines, reference sites and photo-sharing or other online communities. Postbox will support all popular email protocols including IMAP, POP3, SMTP, Mobile Me, Gmail, RSS and Newsgroups, as well as integration with web services like Google, Flickr, Facebook, Twitter, and Delicious. Postbox is currently in beta build. You can register on their Website to be notified of developments. For more deals on current and discontinued notebook models, see our MacBook, MacBook Air, 15" MacBook Pro, 17" MacBook Pro, 12" PowerBook G4, 15" PowerBook G4, 17" PowerBook G4, titanium PowerBook G4, iBook G4, PowerBook G3, and iBook G3 deals.